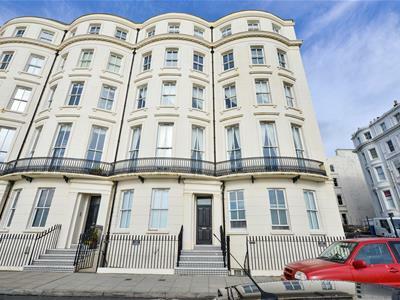 The entrance to this Regency converted mansion block is to the side of the terrace on Chesham Place, a wide, quiet grade II listed street just a few steps from Brighton's famous seafront promenade and a short walk from the hustle and bustle of vibrant Kemp Town Village. Smart black and white chequered tiles lead up to a grand Corinthian columned porch and handsome black door to a very well kept communal hallway with a passenger lift. 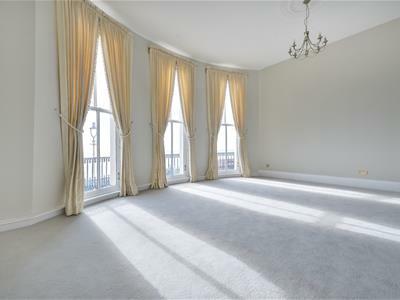 The Grade II listed three double bedroom apartment occupies the 'piano nobile' of what would have been a grand regency house, obvious in this apartment by virtue of the five-large floor to ceiling double glazed sash windows, in the stunning reception room. 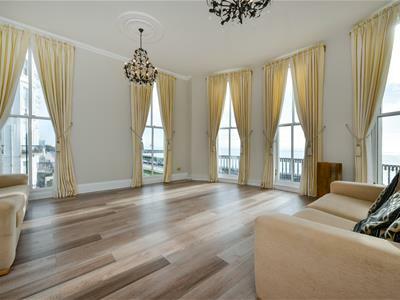 The exceptional reception room with wood flooring is dual aspect with a further two floor to ceiling sash windows making the most of the far-reaching view to the east and enjoys uninterrupted sea views to the south, all of these windows with the fantastically high ceilings creates a voluminous light and bright space, with a certain wow factor leaving a lasting impression. 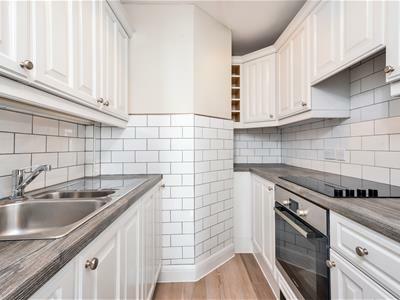 Tucked away off the reception room is the kitchen with white metro inspired tiles and grey grout it is off set by the grey work top and white cabinets with integrated fridge and washing machine. 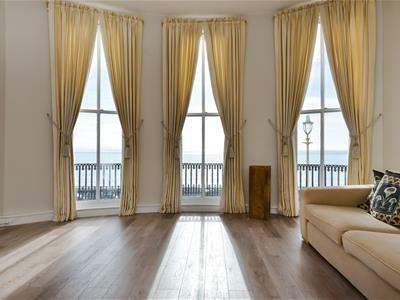 This apartment is magnificent, in that it is double fronted so the sophisticated master bedroom suite, mirrors the size of the fabulous lounge, so you wake up to an incredible view. 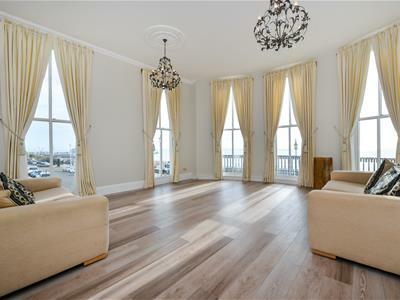 This stunning room with double built in wardrobes also enjoys the high ceilings and three sash windows out to a further curved balcony with sparkling sea views. 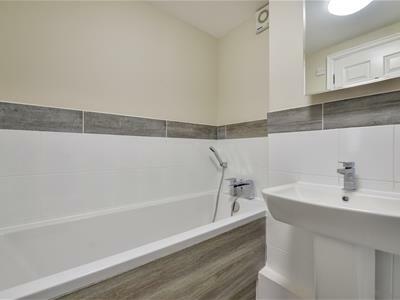 Down a few stairs an en-suite is tucked away with a modern bathroom ideal for soaking in on an evening, which has been recently refitted and tiled with white tiles and accent grey boarder. 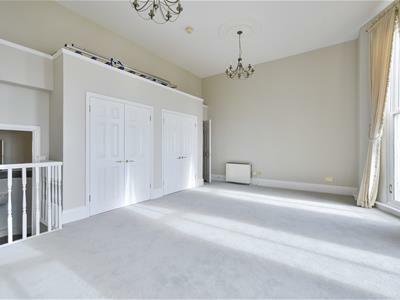 Back on the landing along the soft grey carpeted hallway is the third bedroom next to a shower room with recently fitted white suite with WC and pedestal sink and sliding glass door to the shower cubicle. The second bedroom with two sash windows to the rear of the property is up a small flight of stairs past a galleried landing that overlooks the hallway below, a door that leads out to the common way ideal for the occupier to have their own independence, this level also enjoys the benefit of an en-suite bathroom off the bedroom. 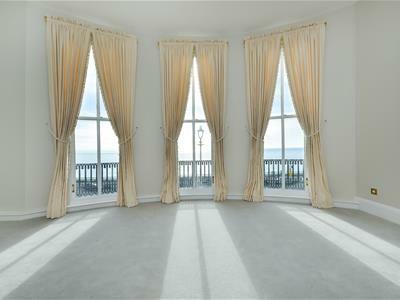 All the bedrooms have soft grey carpet of good quality and making the room’s cosy under foot. 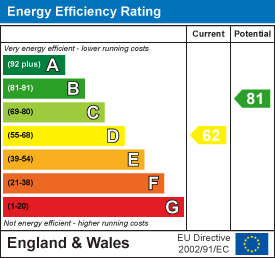 The communal hallway is clean and bright, with lights which automatically come on as you pass and the passenger lift is on the right, as you come into the buildings entrance. 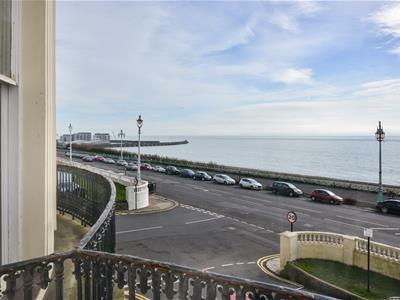 Percival Mansions is one of Kemp Towns Premier Regency Terraces, fantastic as it is set off away from Marine Parade, and the seafront but still enjoys magnificent views. The vibrant village, where Brighton College is situated is just a short walk where its cafe culture and interesting antique, furniture shops makes it a great place to wonder around with various independent boutique shops it has a lovely village feel. Eating out is a treat in this area with various gastro pubs and restaurants, or walk into the Brighton Laines is just over a mile away. 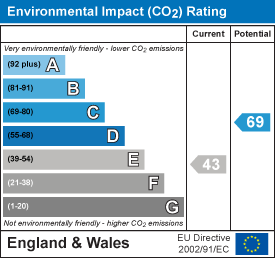 If you wanted to use public transport, buses regularly run along the seafront from Eastbourne to the east and Worthing to the west travelling through the city centre itself. For those that want to travel around the city by bicycle, this apartment has access to the communal bike store. Brighton is a popular city for its culture, access to the arts and bohemian city steeped in history as well as its fantastic location making international travel very easy from Gatwick Airport which is just over 30 miles away and a direct train form Brighton takes less than 30 minutes and a direct train to London Victoria is just under an hour.